On paper the pairing of acclaimed writer Scott Snyder and legendary illustrator Jim Lee on a nine issue Superman series sounds incredible. Both are inarguably supremely talented men – over the past four years, Snyder has written some of the best comics being published, and Lee has long-established his pedigree; I wasn’t reading comics during his X-Men years, but I loved his work on Loeb’s epic Hush storyline in Batman, and Miller’s All Star Batman & Robin. But the tastiest ingredients don’t always mix; and that was my overwhelming response to Superman Unchained. It flirts with greatness, but doesn’t quite reach it. While it’s undoubtedly the best interpretation of the ‘New 52’ Superman we’ve seen (so far) it’s not the standout must-read Superman story fans of the Last Son of Krypton have been pining for. I would happily hand over a copy of Superman: For All Seasons in the hands on a newbie Superman reader; so too any storyline in Geoff John’s pre-New 52 run. 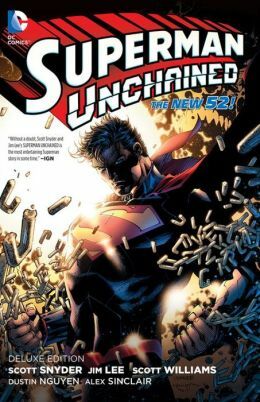 Superman Unchained just doesn’t resonate like those. The story opens with satellites falling from the sky, and Superman doing his thing, rescuing those endangered by the falling gargantuan chunks of metal. He misses one – even Superman’s prone to errors, y’know – but thanks to the intervention of a mysterious and powerful individual, nobody is harmed. But Clark Kent wants to know: who was the interloper? And so, he investigates, and is introduced to Wraith, who falls under the command of a certain General Sam Lane; and queries the veracity of Superman’s mission for “truth, justice and the American way.” Unchained utilizes the core members of Superman’s supporting cast – Lois Lane and Jimmy Olsen all play vital roles, so too Lex Luthor and fellow Justice Leaguers Batman and Wonder Woman. The series is imbedded in continuity, but one needn’t be invested heavily in the DC Universe; Snyder is the master of streamlining his narratives to ensure maximum readability, veteran or newbie. Snyder gradually escalates the menaces facing Superman throughout Unchained, but its climax is satisfactory rather than astounding. It has a certain symmetry, which works, but I’d anticipated it, which lessened its impact. There’s a ton of fun to be had with Superman Unchained. It’s not the defining New 52 Superman tale I’d hoped for, but it shows Snyder has a firm grip on the character, and I’d love to see him given another opportunity to work with him. As for Jim Lee, who I feel I’ve been tremendously disdainful towards here, I’m excited to see where he lands next – his name connected to a project still excites me. But as we shift farther away from his ‘peak’ years during the nineties, I feel he has to pick and choose his projects carefully. His “big budget” style certainly has a place in comics.